Yubeng Village is a Tibetan village at the foot of Meili Snow Mountain in Yunnan Province. It can be said to be a paradise for hikers, offering one of the most alluring hiking destinations in China. 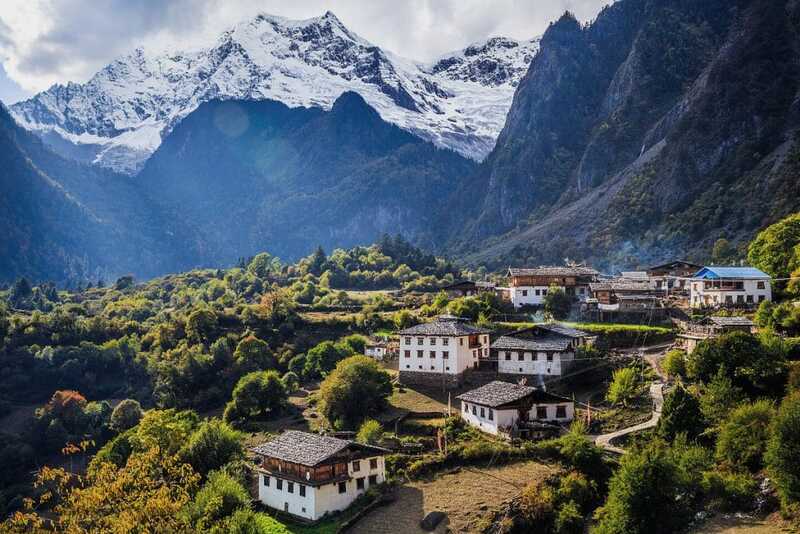 Trekking to Yubeng, the village hidden within the mountains, allows trekkers to step into age-old villages, hike alongside snow-capped peaks, deep valleys, alpine forests, secluded lakes, flower-carpeted valleys, beautiful grassland and waterfalls. Day 1: Drive from Shangri-la to Xidang hot springs, then change to govt jeep directly into Upper Yubeng village, going over a pass at 3700m where we start getting views of the valley where Yubeng is situated. After a descent to 3100m, we’ll set up in a trekker’s lodge in Upper Yubeng Village. Day 2: Today is devoted to visiting Base camp and Glacier lake. This day’s hike is 13km round trip beginning through a narrow valley. We then pass through the wide pasture where Base Camp is located and up the final stretch to reach the Glacier Lake at 3800m. Tonight we again enjoy the respite of a tea-house style trekker’s lodge in Upper Yubeng Village. Day 3: This second day trek we will take from our base in Upper Yubeng Village is to the Sacred Waterfall. From Upper Yubeng, we first go down to cross a river at 3000m and then again ascend until we reach the waterfall at 3600m. If you think you can brave the cold water, you can follow the example of Tibetan pilgrims and bath in the glacier fed waterfall to clean your soul. One can circulate the waterfall three times in a clockwise direction in accordance with Tibetan tradition to pray for good luck. Day 4: This is a long, but easier trekking day. We will leave Yubeng village following the river and a gentle downhill route all the way down to Ninong Village, via Ninong Grand Canyon which is situated along the Mekong River at the very base of Kawakarpo. You can see canyons, rivers and meadows and pass through the primitive forest on the way. Finally, you arrive at Ninong Village and finish your Yubeng Trekking. This will be a long day, for after the long, downhill hike, we will take a jeep back to Shangri-La.